Underage drinking has actually been steadily declining for decades in the United States, but it is still prevalent enough to be a major public health concern. Underage drinking began a steep decline back in the 1980s when Congress passed the National Minimum Drinking Age Act, which required states to raise the age for legal purchase and possession of alcohol to 21 by October 1986 or lose 10% of their federal highway funds. By 1988, all 50 states and the District of Columbia had adopted 21 as the minimum drinking age, setting off a steady decline in underage drinking rates among 8th, 10th and 12th-grade students that continues today. However, according to the 2014 National Survey on Drug Use and Health (NSDUH), an estimated 8.65 million Americans age 12 to 20 reported that they were current drinkers, meaning they had at least one drink in the past 30 days. Males still binge drink and drink daily more than underage females, but the differences are diminishing. White students report the highest levels of drinking, Hispanics are next and blacks report the lowest rates. Of those students who have problems or who drop out, 80% report having gotten drunk in the past month, or reported binge drinking, or reported drinking and driving in the past 30 days. For some students, drinking alcohol is their only behavioral problem, but for others, drinking goes along with other problem behaviors linked to unconventionality, impulsiveness, and sensation seeking, according to research. Typically, binge drinking among students follows the pattern of beginning around age 13, increasing during adolescence, peaking in young adulthood (ages 18-22) and then gradually decreasing. There are many factors that can contribute to the reason that some adolescents begin a pattern of alcohol abuse and develop alcohol use disorders while others do not. Here are some of the key risk factors. Research has shown that genetic factors play a role in a person's vulnerability to developing alcohol problems. We know for certain that children of alcoholic parents are significantly more likely to become alcoholics themselves compared to children of parents who are not alcoholics. But, a family history of alcoholism is not the only determining factor. Environmental influences also play a role in whether someone develops alcohol use disorders and can vary widely from person to person. We also know that some environmental influences can mitigate the genetic influences and cause some children of alcoholics to not develop drinking problems. Studies have revealed that brain waves caused by a response to specific stimuli can provide measurable brain activity that can predict the risk of alcoholism. P300, a specific brain wave that occurs about 300 milliseconds following a stimulus of light or sound, is one of the brain waves used in these studies. If someone demonstrates a low P300 amplitude it indicates an increased risk for developing alcoholism, especially among the sons of alcoholic fathers. Scientists were able to predict alcohol and other drug use in preadolescent boys four years later at the average age of 16 by measuring their P300 brain waves. Behavior patterns in early childhood have also be found to be predictors of later drinking problems. At age 3, children who were classified as "under controlled"—impulsive, restless or distractible—were twice as likely to be diagnosed with alcohol use disorders at age 21 compared to 3-year-olds classified as "inhibited" or "well-adjusted." Children who exhibit aggressiveness as early as ages 5-10 are more likely to use alcohol and other drugs during adolescence. Children who exhibit antisocial behavior are more likely to have alcohol-related problems during adolescence and severe alcohol use disorders in adulthood, research shows. 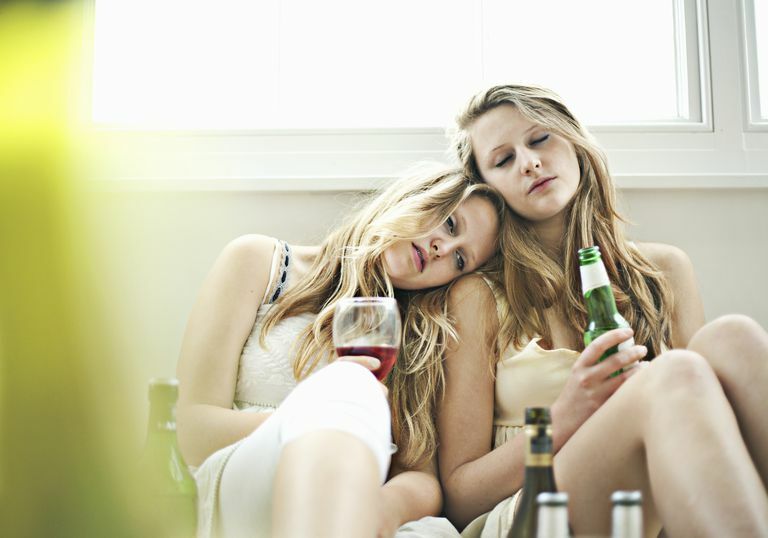 Adolescents who are heavy drinkers are more likely to have conduct disorders. Boys from 6 to 17 with attention deficit hyperactivity disorder (ADHD) and who had weak social relationships were significantly more likely to have severe alcohol use disorders four years later. College freshmen with anxiety disorders were twice as likely to have severe alcohol use disorders compared to those without anxiety disorders. College students with drinking problems were four times as likely to have a major depressive disorder. Along with the factors listed above, there are a number of psychosocial factors that increase the risk of underage youth making a decision to begin early-onset alcohol consumption. Parents are the single most important influence on their children's decision to become involved in substance abuse or not. Studies show that parents who drink or express favorable attitudes about drinking are linked to their children initiating alcohol consumption and continuing to drink. On the other hand, children who are warned about the dangers of alcohol by their parents are less likely to start drinking underage. The same is true for children who report being close to their parents. A lack of parental communication, support and monitoring have been linked by researchers to the frequency of drinking, heavy drinking, and drunkenness among adolescents. Studies have also linked parental hostility, rejection and harsh, inconsistent discipline to childhood drinking and alcohol-related problems. Adolescents are more likely to drink if their peers drink, but beyond that, even if their peers exhibit an acceptance of drinking it can influence a child's decision to initiate alcohol consumption. Research shows that adolescents are more likely to begin drinking if they have developed a positive expectancy about drinking. These positive expectancies generally increase with age and can predict both the onset of drinking and problem drinking among young people. Child abuse and other traumatic events are also risk factors for later alcohol problems among youth. Of those adolescents who end up in treatment for alcohol abuse disorders rates of physical abuse, sexual abuse, violent victimization, and witnessing violence are much higher than the general population of adolescents. Those adolescents treated for alcohol abuse were 10 times more likely to have had PTSD while those treated for alcohol dependence were 13 times more likely. Studies of the effects of alcohol advertising on children have found that alcohol ads can significantly increase positive expectancies about alcohol. Alcohol advertising targeted at adolescents has been found to influence alcohol brand preferences and increase the adolescent's intention to drink as adults. In the late 1960s and early 1970s, in the Vietnam war era, many states dropped their legal drinking age to 18. The political thinking was, "if they are old enough to get drafted and fight for their country, they are old enough to drink." Several studies have found that early-onset drinking is linked to the risk of greater substance abuse problems later in life. The earlier a child begins to drink alcohol, the greater the problems he or she will face in adulthood, not only with substance abuse but with meeting important life goals such as education and careers. Therefore, it is important for parents and for society to do everything possible to prevent the initiation of childhood drinking. Laws and policies will only work so far, the real work begins in the home within the family. Johnston, L. D., O'Malley, P. M., Bachman, J. G., & Schulenberg, J. E. Monitoring the Future national survey results on drug use, 1975-2012. Volume I: Secondary school students. Bethesda, MD: National Institute on Drug Abuse, 2012. National Highway Traffic Safety Administration. "Lives Saved in 2008 by Restraint Use And Minimum Drinking Age Laws." June 2009. National Highway Traffic Safety Administration. "Traffic Safety Facts 2008: Young Drivers." 2009. Shults, Ruth, et al. "Reviews of Evidence Regarding Interventions to Reduce Alcohol-Impaired Driving." American Journal of Preventive Medicine 2001.